In our search for cost and time effective solutions, we can easily overlook simple concepts that reap great benefits in the long-run. In the design stages of transportation and development projects where noise analysis could be involved, it is common to make one of largest time and resource consuming mistakes without even realizing it — neglecting to bring in an acoustic consultant early on. There are some issues that we can run into when we don’t consider noise during initial design. There can be additional unforeseen costs and schedule delays in the design and extra time needed for construction. As a retrofit, noise abatement can be expensive, running up to a quarter of the total project cost. When a consultant is brought in early, these costs can be avoided. By eliminating noise impacts from the beginning, there is less public outreach; less mitigation analysis, design, and construction; proper right-of-ways are implemented; and maintenance costs are reduced. Project construction schedules are shorter/smaller, and the public is provided with better results overall from the project. It is understandable that many considerations may only come up as policy mandates, so it is sometimes hard to know when noise abatement, among other things, is required. For federally funded transportation projects, a traffic noise study is required when the roadway has a substantial physical alteration or if there are improvements that would increase its capacity. For developments, there are local noise codes where the noise levels at the properties cannot exceed specific thresholds. As soon as the thresholds in question are being approached, it is time to bring in a consultant. A consultant can help shape the design of the transportation facility and/or development site plan to account for noise concerns in several ways. One is through land use planning. According to The Federal Highway Administration, “Noise-compatible land-use planning encourages the location of less noise-sensitive land uses near highways, promotes the use of open space separating roads from developments, and suggests special construction techniques that minimize the impact of noise from highway traffic.”1 Essentially, a noise consultant can implement noise-conscious design principles to ensure the setting of residential areas further from louder noise sources, avoiding costly retrofitting. Other methods of accounting for noise concerns in early design stages include the establishment of a buffer, alteration of horizontal/vertical alignments, line-of-sight checks from noise source to noise sensitive areas, and traffic management such as traffic signal coordination and traffic calming like speed humps, roundabouts and road narrowing. When considering options for noise mitigation for your site, a consultant can help make the correct choices. For example, contrary to popular belief, vegetation does not adequately prove noise abatement. In fact, there needs to be 200’ of dense non-deciduous vegetation in order to barely perceive a sound level reduction. Any benefits are purely visual and psychological. Instead, the two most common methods of noise abatement are noise walls and berms. Further considerations for noise mitigation include post spacing and drainage for noise barriers, right-of-way, utilities, and vehicle stopping sight distance. Lastly, a line-of-sight (LOS) check should done at critical locations to determine the minimum height top of wall elevations needed to block LOS within a 500-ft radius since this typically provides a readily perceptible noise reduction. These considerations can all be properly accounted for through the experience and expertise of a consultant. Next time you are planning a transportation or development project, watch for the key indicators for significant noise impact. 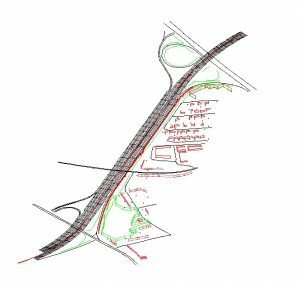 If a road alteration is substantial or is made to change its capacity, or if development noise thresholds are being encroached, consider hiring an acoustic consultant. It could save you money and increase the quality of the end product!